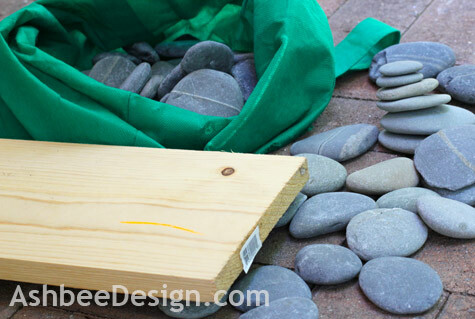 I love rocks and stones and I use them often in projects. 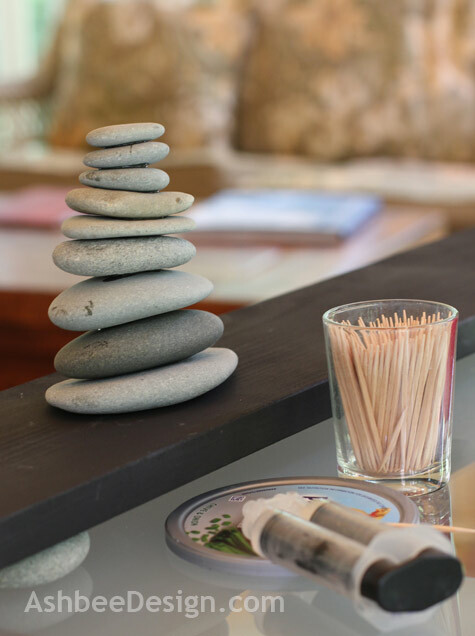 I collect them when we travel and hopefully will have the right type when I want them - especially the beautiful smooth rocks sculpted by the sea. 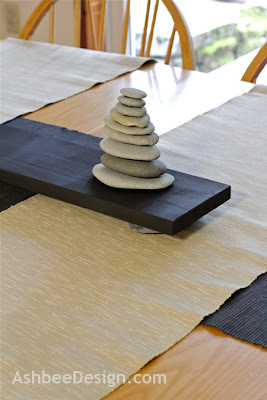 I was feeling the need for a sea stone centerpiece and pulled out my collection. 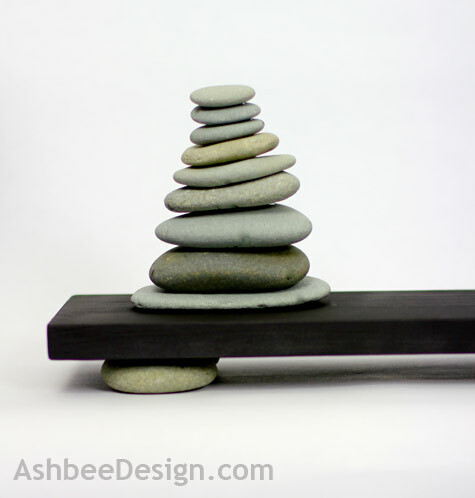 I love the Zen quality of stone stacks but the rocks in my collection created a stack that was too tiny in proportion to my table. I decided to add a long vertical board with little stone feet for separation. I gathered my suplies and started creating. The results were artsy and much to my liking. 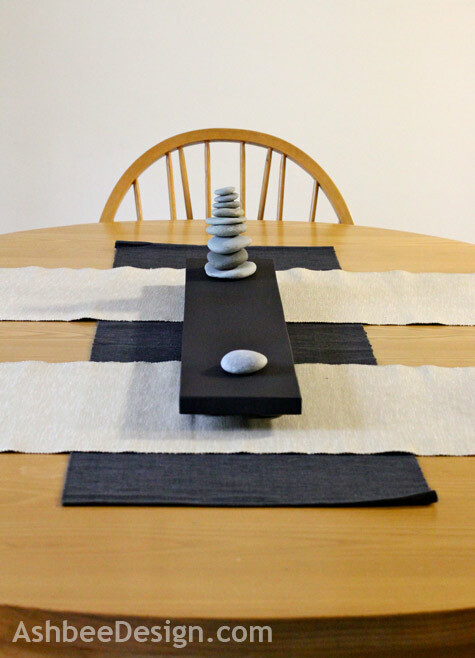 I sincerely wish I had a set of black onyx dinnerware to complete this tablescape! This qualifies as one of those quick and easy projects. Here are the steps I followed. 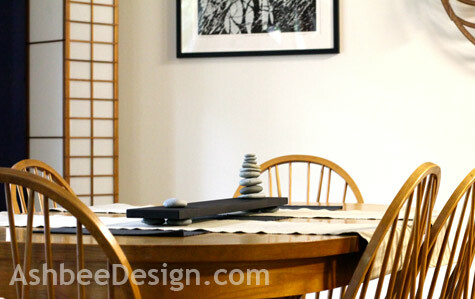 Using the proportions of my table as a guide, I cut the pine board to be 30" long and 5" wide. 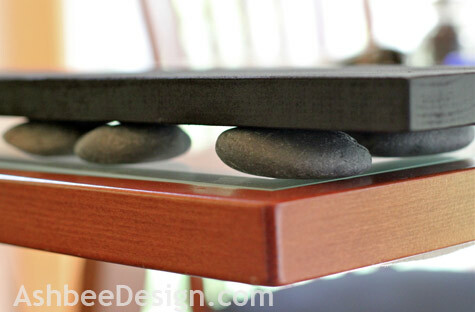 If you are trying this, look at your own table and collection of rocks. I wanted the board to fill the center space adequately. I cut the board on the band saw and sanded it smooth. After wiping off the dust I started spray painting. 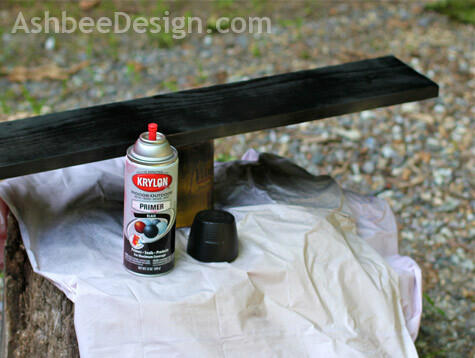 As always, I worked outside and applied the spray paint in many light layers. 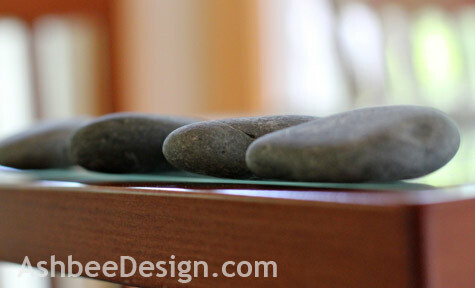 The biggest challenge in this project is finding four stones for the feet. They need to be the same height so the centerpiece won't wobble. I lined up the rocks and found the best grouping. 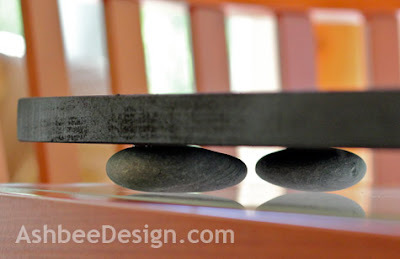 In my mind I saw the centerpiece being balanced on 4 rocks that were taller - maybe 1 1/2" round, but I didn't have anthing like that in my collection never mind 4 matching ones. Next time I am at the shore I'll have to collect round rocks as well as flat. 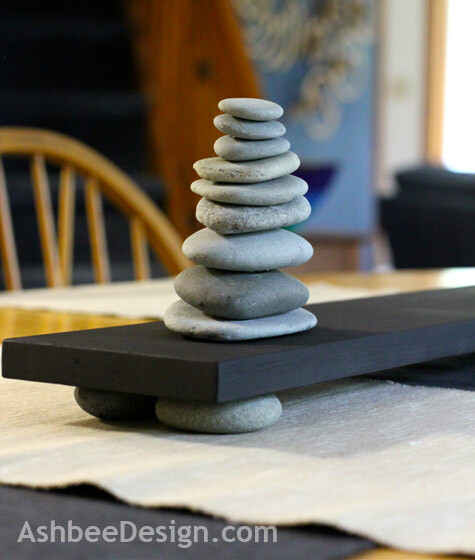 I balanced the painted board on top and chose the best four foot rocks. For assembling both the tray and tower I used 5-minute epoxy. 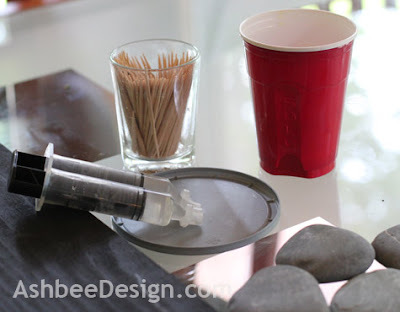 I am sure other types of glue would work with these materials as well. First I glued the feet to the bottom of the board. I then I glued the stones in the tower together. The tower did stand alone but it would topple any time the table was wiggled. I figured that would be annoying during a dinner party. After the glue had dried I assembled the parts along with various runners on my table playing with different combinations of dark and light. Simple, elegant, free! A great combination. This looks awesome! Thanks for sharing at Romance on a dime. I hope you link up this Tuesday! Perfect beach zen. Love it!! This is super cute! I may have to consider making this for my bathroom! Thanks for the inspiration! We will be featuring your project tonight on the Someday Crafts Blog. Please stop back in and grab a Featured at Someday Crafts button for your blog. Thanks again for sharing your project! Oh I love this! 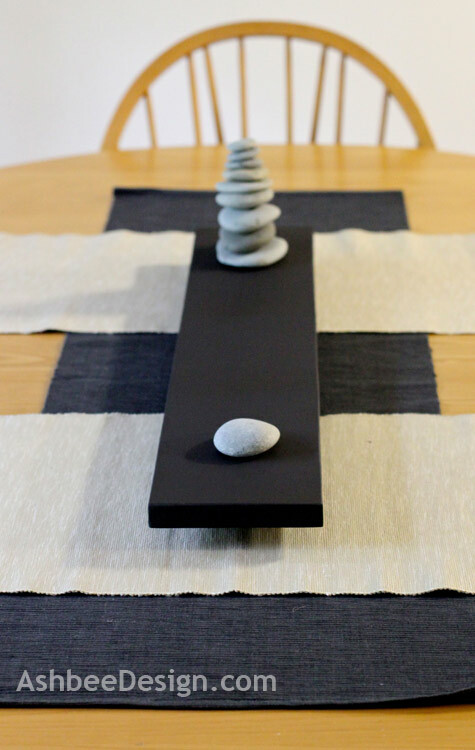 I need a Zen centerpiece! Beautiful! Stunning! I love the way this came out. Thanks everyone for your comments. I have learned that it is important to have a supply of smooth stones in a perfect size gradation on hand at all times. I see another trip to the shore is necessary. A need to add to the stone collection grows. Sometimes it is the simple solutions that are most beautiful. This one falls into that category. Thanks for visiting and commenting.